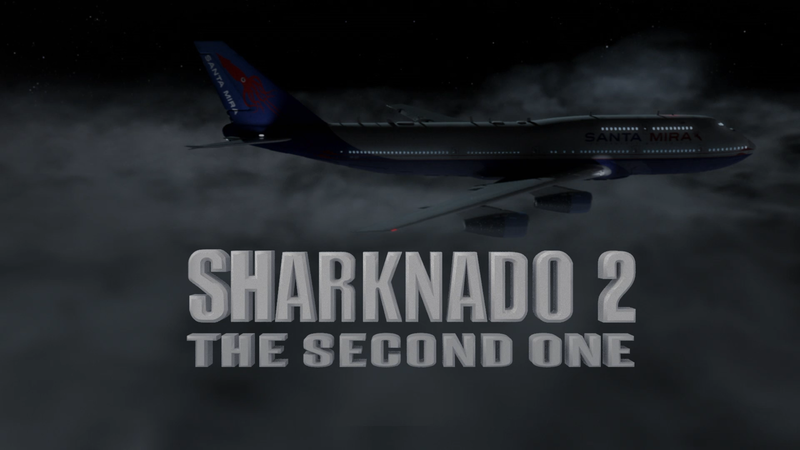 Sharknado 2: The Second One is a great entry into the series and is a whole lot of fun through and through with great in-jokes and some wonderful cameos that were great to see (particularly Robert Hays in a fun callback to Airplane). This obviously is not something to take seriously and is especially fun to watch with friends making for a better experience. SyFy really hit a gold mine with 2013’s Sharknado which heavily trended on Twitter and thus the sequel, Sharknado 2: The Second One, was quickly put into production and not only got record ratings for the network but even saw a limited theatrical run. Having not seen the first, I watched it on TV with fresh eyes and just about loved every minute of this so bad it’s good flick stocked full of cameos and in-jokes making for one heck of a ride. The “story” opens about a year after the events in Los Angeles. Fin (IAN ZIERING) and April (TARA REID) are headed to New York where April is attending a signing for her new book, ‘How to Survive a Sharknado’ when Fin peers out the window and sees, what do you know, sharks in the clouds! He tries, without success, to ignore it attesting it to be in his mind but it becomes real when one slams into the plane’s engine and soon enough, both pilots (with a fun cameo by Robert Hayes) being killed as a shark crashes through the windshield. Fin steps into action and manages a fine crash landing saving most of the passengers, though April loses her hand as one shark, she believes, targeted her. Meanwhile, in New York City, Ellen (KARI WUHLER), Fin’s sister, and her husband Martin (MARK MCGRATH) and two kids, Mora (COURTNEY BAXTER) and Vaughn (DANTE PALMINTERI), are visiting unaware of the impending shark storm heading their way. Martin and Vaughn head off to attend a Mets game, which Fin is supposed to join them although the two childhood friendship has cooled, while Ellen and Mora go to Staten Island. With two systems coming together, one cold and the other warm with some sharks in the mist, the epicenter for raining sharks is in NYC and the only man to stop it and save the city is Fin in epic fashion using whatever is available including a chainsaw, something that would make even Ash proud (hopefully Sharknado 3 can nab a cameo from Bruce Campbell; he’d fit right in with the movie). 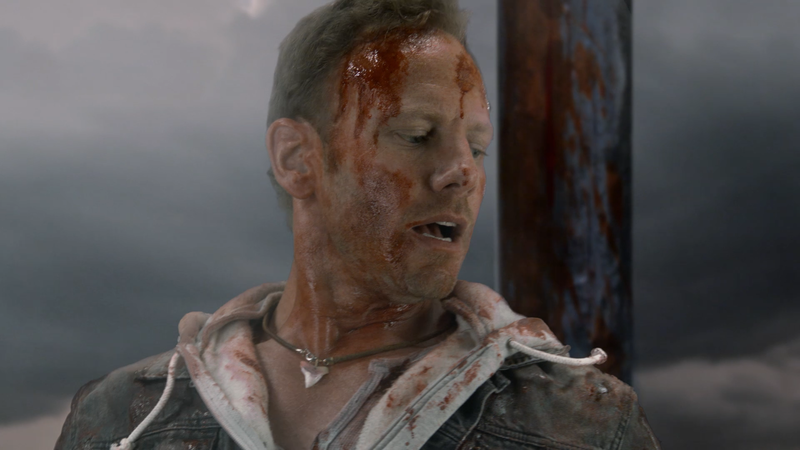 Listen, Sharknado 2 is a bad movie… deliberately bad and revels in its awfulness from the acting, characters (although Ian Ziering as Fin makes for a great leading man) and, especially, the visual effects are downright awful. The filmmakers know what they’re making and audiences know what they are watching, a movie that’s not meant to be taken seriously and at the same time has some truly funny jokes that helps pass the time particularly if one watches it with friends or a crowd because if you watch something like alone, you’ll feel like an idiot. This release comes with a matted slip cover. Before I get into the specifics, I have to note that the features list, as well as the overview, for some reason is in tiny font that even young eyes will have problems reading. Not sure why they did that since there’s plenty of space, but thought I’d mention it. Audio Commentaries – We get two tracks, the first is with Director Anthony C. Ferrante Actors Ian Ziering and Tara Reid and the second with Ferrante, Writer Thunder Levin, Editor Ana Florit and Visual Effects Supervisor Emile Smith. Both tracks are a lot of fun and actually fairly informative providing different aspects of making the movie. The Making of Sharknado 2 (10:41) is a behind-the-scenes featurette with on-location interviews with members of the cast and crew. 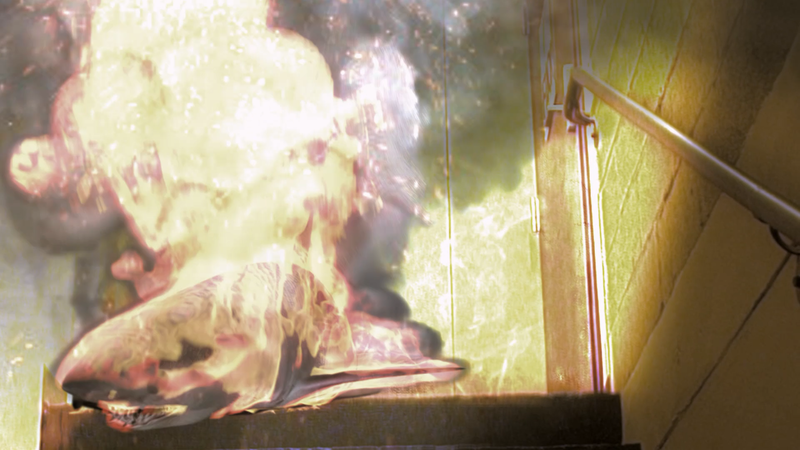 Chomp: The Evolution of Sharknado 2 Visual Effects (4:08) looks at the VFX breakdown. Shark Chum: From the Cutting Room Floor (8:36) is a collection of deleted scenes cut down or excised from the final film. Cameos: I Can’t Believe They Got… (10:57) shows off the cameo appearances and the difficulties in scheduling. Gag Reel (5:38) contains your usual line flubs and such. 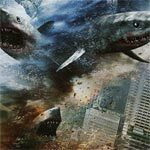 Sharknado 2: The Second One rains down onto Blu-ray presented in its original televised 1.78 widescreen aspect ratio and a 1080p high-definition transfer. Honestly, this isn’t that good looking of a movie considering it was done on the cheap and very quickly but still detail levels aren’t altogether bad but colors are a bit drab rather than colorful or vibrant. The 5.1 DTS-HD Master Audio track is probably overkill for a movie like this but still includes clear dialogue levels coming from the center channel and the front and rear speakers provide for some of the audio effects and ambient noises. It’s nothing special or dynamic but effective enough considering the source. 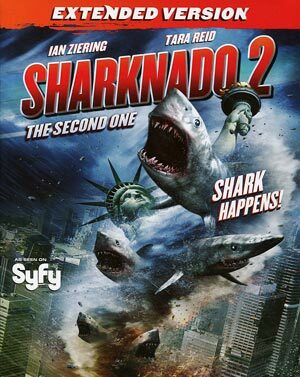 Overall, Sharknado 2: The Second One is a great entry into the series and is a whole lot of fun through and through with great in-jokes and some wonderful cameos that were great to see (particularly Robert Hays in a fun callback to Airplane). This obviously is not something to take seriously and is especially fun to watch with friends making for a better experience. The Blu-ray released by Cinedigm offers OK video/audio transfer but a fair amount of bonus material.